Asteroid Schoolhouse - "Blame Your Parents And Move On"
Asteroid Schoolhouse play lo-fi instrumental improvised space noise rock. Harsh stuff indeed. No instrumentation is listed but it sounds like electric and acoustic guitars, bass, and electronics. The band consists of Lois Poit, Pedro "Fuzz" McCorkle, Alonzo Phillips, Wade Coldwater, and Sarah Lee Raisin. The opening track, "Mercury", sets the pace for the album being a symphony of drone, static, fuzz, and various other sounds and voices backed by bleeping, and even faintly melodic, space synths. "Jupiter" is like Mercury only more of a space freakout and is one of my favorite tracks. Throughout the album there's a lot of guitar driven space-noise... NOT music to meditate by. It's harsh, but thoughtful in that it's more than just an incessant wall of drone that goes nowhere. There's a sense of development that parallels lots of good electronic space music. This just happens to be rather... abusive on the senses. For some reason the third track has white-out over the title on both the back and inner sleeve track listings, but it stood out for me consisting of what sounds like radio transmissions from space that are mucho brain-piercing. "Mars" features a steady drone setting the backdrop for a continually phased guitar line. Having this searing feedback drone traveling smoothly from one ear to the other with headphones on was a weird experience. "Vernal/Autumnal Equinox" is an interesting track being more of a melodic drone piece with a faint but cool sounding phased bit running throughout the track. This could actually have worked as a vocal tune. "Neptune" is a bit different. Here we're getting into the realm of freeform experimental guitar, though the space-noise factor is still present. An interesting mixture of Beefheart, Hendrix, and Frith. There's no real instrumental proficiency level but the combination of notes and sounds is intriguing. And speaking of Frith, "Neuron" is labeled 'for Fred Frith', though its cosmic noise feedback freakout assault makes it more of a Hendrix mindfuck than a Frith piece. Finally, "Wade Alone" is labeled 'for Derek Bailey' and is a very cool feedback-laden Blues-noise fest and one of my favorites tracks on the disc. 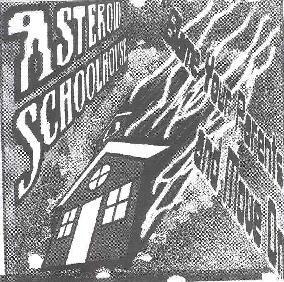 In summary, Asteroid Schoolhouse will appeal to fans of harsh guitar/electronica space noise. The music is played at a steady pace making it digestible, and as harsh as it is there are still separate discernable elements rather than being one big muddled stew. Still, I found the 40 minute length of the CD to be quite enough as this stuff is difficult to take in large doses. For more information you can visit the InstrumenTales Records web site.